This book is part of a two-volume work seeking to demystify the nature and causes of the Arab 'revolutions' (the 'Arab Spring'). It is shown that the aim of the transnational elite, which informally administers globalization, has always been the same in all these 'revolutions', including the attempted color revolution in Iran in 2009. That aim is to secure the full integration of all Arab regimes and Iran into the New World Order (NWO). This Order was established following the collapse of the Soviet block and the parallel universalization through neoliberal globalization of the internationalized market economy and its political complement, representative 'democracy'. Globalization is not only economic. It is also political. First, because as nation-states lose their economic sovereignty they wither away; second, because globalization implies a compatible type of political structure that facilitates it. As representative 'democracy' has proven much more effective than the usual authoritarian regimes in imposing the huge concentration of economic power, incomes and wealth that globalization brings, a Muslim Brotherhood-based 'democratization' has been initially selected by local and foreign elites to achieve the Arab world's full integration into the NWO. Finally, globalization also has an ideological dimension that justifies the need for the drastic restriction of national sovereignty, under the pretext of protecting human rights and the implied new doctrine of 'Responsibility to Protect'. However, an important element of the Arab Spring is that, although the aim of the transnational elite has been the same everywhere, they have targeted the various countries by different means, which are variations of the Western-instigated color 'revolutions' in Eastern Europe. First, integration through a form of fake democratization (Vol. 1). This refers to the client regimes in Tunisia and Egypt, in which the transnational elite provided the trigger for uprisings which were 'waiting to happen' as well as the very efficient internet infrastructures to back them up. Furthermore, it was the same elite that helped 'guide' these uprisings through NGOs and other controlled organizations, so that these 'revolutions' would not in any way threaten their aims. These were to replace local political elites with personnel who would be in a better position, through their 'democratic' credentials, to achieve the full integration of these countries into the NWO. At the same time, they would cooperate in creating the preconditions for the pre-planned armed insurrections in Libya and Syria. Iran is a case of its own, as it is not an Arab nation and the Western campaign to get rid of the rogue Islamic regime, which was established following the 1979 national liberation uprising, began almost immediately afterwards. The latest phase in the process of regime change began in 2009 with an attempted color revolution, which was particularly important with respect to the Arab Spring as, in fact, it functioned as its precursor. 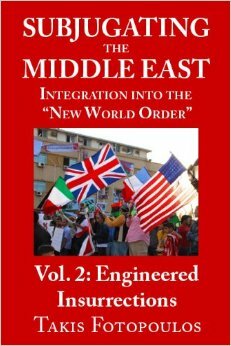 Second, integration through engineered insurrections (Vol. 2). These were launched against the non-client regimes in Libya and Syria and were, in fact, pre-planned armed insurrections masquerading as popular uprisings. In both Libya and Syria, the engineered armed insurrections were to be complemented by Western military intervention for regime change. Another reason the demystification of the Arab Spring is particularly important, is that its nature has been completely distorted by an unprecedented manipulation of world public opinion. Last but not least, the international liberal 'Left' actually supported the campaigns for regime change by endorsing the so-called 'revolutionaries' participating in the Arab Spring. Takis Fotopoulos is a political philosopher and economist who founded the inclusive democracy movement. He is noted for his synthesis of the classical democracy with the libertarian socialism and the radical currents in the new social movements. He is the editor of The International Journal of Inclusive Democracy (which succeeded Democracy & Nature). He is also a columnist for the Athens Daily Eleftherotypia. He was previously (1969 1989) Senior Lecturer in Economics at the University of North London. He moved to London in 1966 for postgraduate study at the London School of Economics, on a scholarship from Athens University, after earning degrees in Economics & Political Science, as well as in Law from the University of Athens. He was a student syndicalist and activist in Athens and then a political activist in London, taking an active part in the 1968 student movement in London, as well as in organisations of the revolutionary Greek Left during the struggle against the military junta in Greece (1967-74).